A slow-burning depiction of economic degradation in Thatcher’s England, Mike Leigh’s Meantime was the culmination of the writer-director’s pioneering work in television and became his breakthrough theatrical release. Unemployment is rampant in London’s working-class East End, where a middle-aged couple and their two sons languish in a claustrophobic public housing flat. As the brothers (Phil Daniels and Tim Roth) grow increasingly disaffected, Leigh punctuates the grinding boredom of their daily existence with tense encounters, including with a priggish aunt (Marion Bailey) who has managed to become middle-class and a blithering skinhead on the verge of psychosis (a scene-stealing Gary Oldman, in his first major role). Informed by Leigh’s now trademark improvisational process and propelled by the lurching rhythms of its Beckett-like dialogue, Meantime is an unrelenting, often blisteringly funny look at life on the dole. Some films set out to encapsulate their time and place. Whether this is through the art, music, or fashion of the era, they're trying to grab onto those small details, hold them, and preserve them like some sort of cinematic time capsule. Films also have a way of capturing the mood and economic status of their time by showcasing real-to-life characters trapped in unfortunate situations. 1984's Meantime from writer/director Mike Leigh stars Tim Roth and Phil Daniels as two brothers who live their lives economically stranded in London's East End during the peak of Margaret Thatcher's time as Prime Minister. Colin (Tim Roth) and his brother Mark (Phil Daniels) don't have a whole hell of a lot going for them. They live with their beleaguered parents Mavis (Pam Ferris) and Frank (Jeffrey Robert) even though they're both fully grown men who should be part of the work force - or looking for work. But they don't have to actually look for work. They're on the dole and that's good enough for them. As Mark and Colin drum about looking to get free drinks off their pals or just waste away their days, Colin gradually starts to want more from life. The only problem is Colin is slow - or at least everyone tells him he is so he never tries to do anything about his situation. He doesn't ask out the pretty girl who likes him, and he doesn't stand up to his skinhead pal Coxy (Gary Oldman) who bullies him. 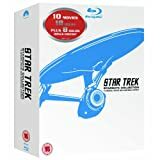 When Colin and Mark's aunt Barbara (Marion Bailey) comes around offering Colin a job painting her posh new home, the rising jealousy in the family may outweigh the value in any temporary economic success. It's difficult to call Mike Leigh's Meantime a good movie or a bad movie since it plays with so many personal and sociopolitical emotions. How you respond to this movie is going to depend entirely upon the personal and political liabilities you bring into your home screening room. The world presented in Meantime is harsh and unflinching and doesn't pull any punches. Likewise, the characters within the film make you angry while also forcing you to conjure up an amount of sympathy for their situation. On one hand, you're angry at Mark, Colin, and their parents Frank and Mavis. You see Mark, Colin, and Frank waste their time at pubs and then stand in line for hours so they can get their cash from the government - all the while their mother works a job, cooks and cleans the crappy tenement apartment the four inhabit. It's frustrating to watch these people struggle to eke out a meager existence without applying themselves. But on the other hand, I know that sentiment is coming from a lofty position of privilege looking down. That is why when the economically secure Barbara comes around offering menial jobs feels almost insulting. She's not offering the job out of genuine need, she could easily paint her own home, she's just throwing her nephew a scrap from her high table. Wherever you fall on the political spectrum, Meantime is a tough look at life on a welfare system. Its design and intention were to keep people afloat until they find something better. But when nothing better can be found, why would you keep looking? It's the generational impact this system has that lands the true gut punch of Meantime. While Mark is far quicker and abler than his brother Colin, Colin isn't exactly feebleminded either. He can apply himself if and when he wants to, he's just been told he's worth nothing more than his government check for so long that's the only thing he knows. It's a tragic cycle without end. Throughout, the cast of this film delivers a series of terrific performances. If you've watched enough Quentin Tarantino movies or flicks like Rob Roy or The Hit, You know that Tim Roth is a hell of a performer with an energetic confidence. It's jarring seeing him in an early role as a meek and shy character like Colin. He says little but communicates the character's unease and worry with his wild eyes and shifting body. No less impressive is Phil Daniels as Mark. Daniels, like his character, can't sit still. His Mark knows there's a better life and world out there but he just hasn't figured out how to grab it yet so instead he turns his rage and energy against his family. You can see the wheels turning for these characters but the practical application is missing the traction needed to succeed. All of the terrific performances come to life thanks to Mike Leigh's improvisational style. While the scenarios and a few moments feel scripted, a lot of the dialogue and the direction of the performances were left up to the actors. Leigh clearly trusted his cast to carry the film and give its story weight and meaning and the results are raw and engrossing. The film may traverse some emotional socioeconomic territory, but rarely does it ever feel preachy like it's trying to weigh you down with a heavy-handed message. Meantime certainly isn't spending time praising the welfare system by any means, but it doesn't condemn or condone the actions of its characters. The audience is left to do that on their own. Whichever way you feel about these people is likely how you're going to feel about the film itself. It's odd, frustrating, and brilliant all at the same time. 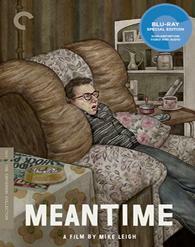 Meantime arrives on Blu-ray courtesy of The Criterion Collection in a single disc set. Pressed onto a Region A BD-50 disc, the disc is housed in a clear Blu-ray case and comes with a booklet containing a terrific essay by Sean O'Sullivan. The disc loads directly to a static image main menu with traditional navigation options. Meantime was originally shot and produced for British television before catching on for a theatrical presentation. As such there's a bit of a sticking point with this film as to the framing. The original television broadcast was in the standard 1.33:1, but all subsequent theatrical presentations were reframed to 1.66:1. As such, this newly minted 2K restoration 1080p transfer follows the 1.66:1 theatrical presentation. In terms of the aspect ratio, I don't have a dog in the fight as the artwork indicates this framing, restoration, and the transfer was supervised by Leigh and his director of photography Roger Pratt personally. After what sounds like a lot of work removing scratches and other debris, this is a beautiful transfer that gets the most out of its 16mm source. Like the story, the image is rough, gritty, grainy, and drab. Detail levels are strong considering the source elements, facial details, clothing, and the squalor of East End come through with terrific detail. Colors are bold with early 80s primaries, blues and reds have a terrific pop and presence in particular. There is some lingering evidence of damage, a little speckling, a slight scratch here and there, but nothing severe. Meantime is packed with stark but effective LPCM mono audio mix. Dialogue is the dominant driver of the film and remains front and center throughout. Sound effects and atmospherics are subdued but effective and give a nice sense to the cluttered messy lives the lead characters live. There is a natural feeling to the cacophony of noise and dialogue reflective of the characters constantly trying to one-up one another. The scene in the welfare line is particularly strong in this regard. Scoring by Andrew Dickson is somber and minimalist only coming in to punctuate the emotion of a particular moment without ever dominating the scene. Levels are spot on without any need to keep your thumb on the volume. All around this is a terrific audio mix for a film of this sort. Mike Leigh with Jarvis Cocker (HD 35:05) This is a great interview as Leigh gets to discuss his approach to the film as well as the film's reception and how it split people politically. Marion Bailey with Amy Raphael (HD 28:22) Writer Amy Raphael sits down with Marion Bailey and discusses Bailey's character and her processes of taking on that role as well as working with Mike Leigh. Tim Roth Interview (SD 31:43) This interview from 2007 is great as it allows Roth to discuss his early career not knowing anyone or who anyone is and getting this opportunity to break out. Meantime is a tough and unflinching look at life on government assistance. The film was chastised during its initial release for not going hard enough or making a genuine political statement about the rampant unemployment during early 80s England. Instead, writer/director Mike Leigh focuses on showcasing human characters living through tough circumstances that aren't necessarily of their making. With some terrific performances, Meantime doesn't pull punches nor does it preach a political point of view and instead trusts the audience to come up with their own conclusions. The Criterion Collection has done an exceptional job bringing this film to Blu-ray with a fantastic A/V presentation as well as assembling some good bonus interviews that are well worth watching. Recommended.